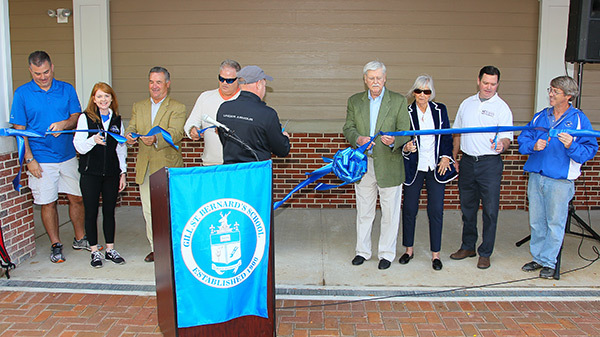 Following the completion of the Field House project, Gill St. Bernard's has broken ground on a new Performing Arts and Community Center (PACC). This new facility will serve to further support and advance GSB's award-winning performing arts programs, as well as serve multiple purposes as an assembly space and speaker venue This state-of-the-art building will feature a 450 seat house, scene shop, costume shop, dressing rooms, 40’(l)x37’(d)x18’(h) stage, orchestra pit, box office, large lobby/gallery and more. The demolition of the old gym took place over spring break and the initial phases of construction of the PACC began immediately. Save Your Seat campaign and to purchase a seat. Learn more about the new PACC coming to GSB.. Learn more about how you can lead. working to make our campus even more beautiful. The PACC is the final capital project of the Delivering the Future campaign. We have raised $6.4M toward the $8.5M needed to fully fund the PACC.